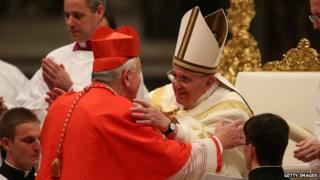 Pope Francis has appointed 19 new cardinals at a ceremony in Rome - the first such appointments of his papacy. Cardinals are the most senior Roman Catholic clergymen below the pontiff. Correspondents say the inclusion of prelates from places such as Haiti and Burkina Faso reflects the Argentine Pope's commitment to the poor. Former Pope Benedict XVI - who retired last year - also attended the ceremony at St Peter's Basilica. The new cardinals received the traditional red hat and robes at the ceremony, known as a consistory, which was conducted in Latin and followed ancient tradition. One by one, they knelt in front of Pope Francis to receive the hat and gold ring of office. Former Pope Benedict's surprise appearance in St Peter's Basilica created an unprecedented fusion of papacies past, present and future. The former Pope, the reigning Pope and the cardinal who will eventually be chosen to succeed Pope Francis when he resigns or dies were gathered together in front of the altar erected over the tomb of the very first Pope, St Peter. It was the first time the ex-Pope had appeared in public since he waved farewell from the balcony of the papal summer residence at Castel Gandolfo last 28 February after stepping down. Now the indications are that the retired Pope will gradually be reintegrated into the liturgical life of the Church, in a very limited way, given his age and his state of health. He will almost certainly be present when Pope Francis declares two of his - and Benedict's - predecessors saints. Former popes John XXIII and John Paul II are to be canonised on 27 April. Mindful of current conflicts in Ukraine, Syria and the Central African Republic, Pope Francis prayed for "peace and reconciliation for peoples currently experiencing violence and war". Sixteen of the new appointees are under 80 - the age limit for participating in the election of future popes. The new cardinals come from 15 different countries, including Spain, Italy and Germany. Among them is the head of the Catholic church in England and Wales, Archbishop Vincent Nichols. The BBC's David Willey in Rome says the appointments are being seen as a clear attempt to share decision-making in the church. The Pope is encouraging cardinals - old and new - to think outside the box in formulating new policies for the Catholic Church, our correspondent adds. The new recruits will join the more than 100-strong College of Cardinals, which has been meeting in plenary session behind closed doors at the Vatican.